Some of these signs are already present, some are occurring currently and yet others still developing. Over time we will track the occurrences as they unfold. Whilst I have applied them to Australia, they are equally applicable in the US, Britain and Europe. 1. When the families cannot maintain their lifestyle. Wages growth has been very low over the past 3-5 years. Accounting for inflation and housing related costs means that keeping a standard of living is almost impossible for most Australian families. 2. When debt level is rising more than inflation. 3. When housing affordability means the number of people over 25 still living with their parents grows. Census figures between 2011 and 2016 showed the proportion of 20-24-year-olds living with parents grew from 41.4% to 43.4%. For 25 – 29-year-olds, the jump was from 15.7% to 17%. 4.When people sacrifice their children’s education for lifestyle. The opportunity to enjoy smashed avocado appears to have won the day. Government schools’ share of student enrolments increased in 2017, continuing the shift towards government schools observed since 2015. In the 20 years prior to this there was a shift towards non-government schooling. 5. When real growth is stagnant. Australias GDP growth has been flat, without great change. 6. When “ill will” to Governments increases. Anecdotally this appears to have been the case particularly in the papers and talkback radio. People are agitated about a range of issues and are taking some matters into their own hands. 7. When the average personal debt reaches 75% of household income. Household debt to income is now at 200%. We are now one of the most heavily indebted. Australians are in illustrious company, ranking fourth highest in the world next to Denmark, the Netherlands and Norway. We note Ireland, Spain, Italy, and Greece have lower personal debt levels than us! Mortgages for owner-occupier housing makes up 56.3% of all personal debt in Australia. Investor debt associated with investments such as rental properties or shares makes up 36.5% of our household debt. 8. When unemployment is at 8% or higher. In Australia, unemployment is said to be 5.6%. At 8% we would have a problem – but with classifications of part time employment and a booming education sector – could we already be there. 9. When tertiary debt increases annually by 12% or more as a result of governments using tertiary education as a means of falsely reducing the unemployment figures. In Australia, growth in student numbers was 8% in the past year (to 2.7m people in 2017). Additionally the growth in the recorded debt 12.7% – or 1.5x the growth in students. In the previous 2 years the student growth was 11% but debt was growing 19.1% per annum. 10. When governments hide the economic issues facing them by diverting the public discussion to issues such as immigration. The loss of truth from business/political/religious leaders is concerning. 11. When the rate of globalisation slows. Trade wars between the US and the Chinese are casting a murky shadow over the world currently. The increase in protectionism and its impacts are about to be felt. 12. When people in the workforce become preoccupied with the security of their position. This leads to little or no teamwork, unity and oneness. 13. When sport talk dominates the news. 14. When the gap between the rich and the poor grows. This appears to be true in Australia. We note the disparity with incomes underlines this trend. It’s important to remember that our Geo-political view may or may not be right, but one thing is for sure the signs are building! Whether more positive or negative this significant issue will have share price effects. Knowing when to buy into the market or sell out of the market is invaluable in a Global Financial Crisis. Investors know it’s rare for all stocks to go down all the time, all at once. Even in a bear market there are upward moves to profit from – if you have the right Buy/Sell recommendations. 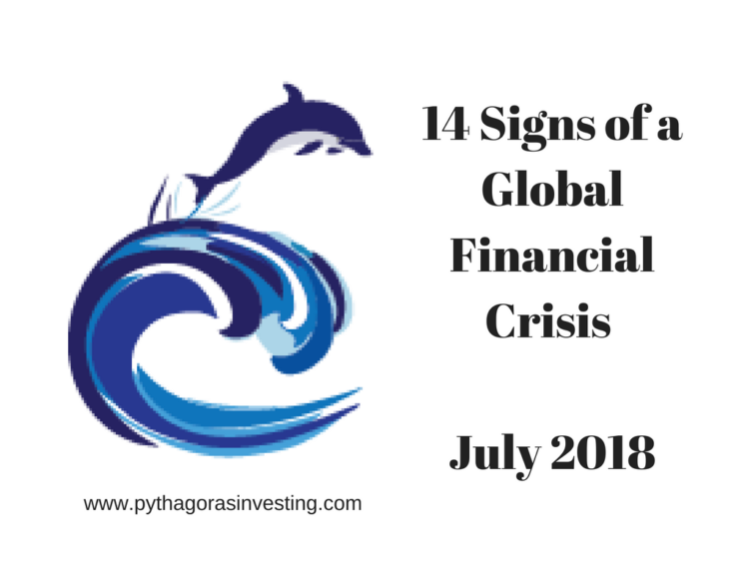 Therefore Pythagoras can make money in any market regardless of the investment environment – in fact its best in the tough markets. We worry less about the events and focus on changes in our Investment Timing Index. This places us at the forefront of investing. Pythagoras is a provider of incorruptible recommendations you can trust. Visit our product page to read more on Pythagoras.